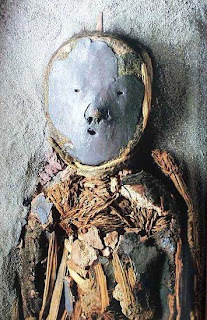 The Chinchorro mummies are the remains of a civilization living in the dry desserts of the Andes. The people of this society showed respect to the dead by carefully opening the body to re-enforce it then decorate it with a mask, clothes, and painting. From a western perspective, some would view this as desecration. Methinks, however, that careful remodeling and preservation of the decease require a great deal of respect for that person. It's not like it's mandatory after all, the dessert could have mummified it either way but the Chinchorro seemed to believed that it eternalized the dead. Of course, this is just my own sophist thought on the matter. There is no way of knowing what went through the minds of the people as they did this other then what we can interpreted from the artifacts left behind. It would be difficult to rely on ethnographic interpretation because it is very likely that the ideologies and practices of the modern decedents have change. However we know some aspects were preserved and passed on. Even today we see locals use the same practices of civilization like Moche and Inca. And at the risk of sounding like all my other professors, more study need to be made soon before the cultures disappear.